Mega Man V continues the handheld Mega Man tradition of favoring roman numerals over arabic numbers. 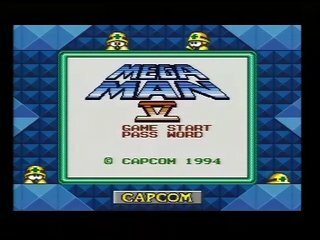 It does manage to discontinue the handheld Mega Man tradition of lazily reusing Robot Masters. Instead there are Stardroids themed after planets. This game hails from the halcyon days of yore, so yes, there is a Pluto. Mega Man V also introduces a helpful cat named Tango, similar to Rush. Capcom soon realized that in fact cats are very lazy and thus a robotic cat helper doesn't make much sense, so Tango was banished and never seen again, besides that one time he appeared in a WonderSwan game nobody played. Best Time: 0:45:21 by 'MrCab' on 2014-11-06. Thanks go to Preddy, the previous run holder, for his excellent run commentary. I can only hope to honor him by doing the same here. The segmented run clocked in at 47:15, on an English cart, and I am jealous of passwords restoring weapon energy. Thanks to Mothrayas for an excellent TAS of the game as well. It has lots of good info in its notes on the TAS runs page, and is worth a read if you plan on running this game. The TAS delivers the final blow to Sunstar around 39:30! Thanks/shout outs also go to Virtual Boy Ness and Tremane for helping test things out and being good competition for improving my time. The buster is replaced with the Mega Arm. It has 3 levels: Uncharged lemons (1 damage), a half charge for 2 damage, and a full charge for 3. In addition, the charged shots fire Mega Mans arm off, and deal the same amount of damage as the arm returns to Mega Man. This is useful in Mercury's stage and Mars's stage, and gets refereed to in these notes as "Snapback" damage. The half charge is also the best DPS for the buster. It's also a great backup strat against most bosses when you're low on the weakness (and not resetting, so usually a race). Starting with the Dark Moon fight, Mega Man will NOT have his weapon energy restored between stages (including the weapons used in the Dark Moon fight), so managing weapon energy in the second half of the run is critical. Some drop luck is needed too, as there are not enough drops given for free in stages to finish the run. Watch for the Weapon Energy drop before Enker, it saves the run. There is at least 1 TAS strat that is not even attempted specifically because of weapon energy concerns, and human inability to manipulate weapon energy drops. Pluto's Break Dash weapon deserves special explanation as well. It has FOUR charge levels, though only 3 are visible. Uncharged it fires normal lemons for no energy cost. It has 3 charge levels, 30-60, 60-90 and 90+ frames. each one takes Mega Man further along the screen during the resulting dash attack, but deals the same damage. The interesting parts of the weapon, however, are that they all also give you invincibility frames as if you had taken damage. This gets used extensively in Jupiter's stage, as well as a few times in the beginning of Dr. Wily's fortress, The Wily Star. The first two charge levels use the half buster charge animation and cost 0.5 weapon energy units, the full charge costs 2. Knowing this is critical to weapon energy management. There is one other piece to Pluto's Break Dash - once you use it, you don't become vulnerable again until you do something other than slide. This is only useful in the Wily star, due to the lack of long flat sections. Jupiter's weapon is amazing. It's hit box is bigger than it appears, it lasts long enough to hit enemies twice outside of Virtual Console, and only costs 1 point of weapon energy. You cannot walk while shooting it, but you can jump while using it or slide cancel. It gets used extensively in Saturn and Uranus's stages. It can also destroy shots. Jupiter’s electric shock will work differently on 3DS VC than in this run. The easiest place to notice this is the weapon get demo, where on 3DS Mega Man will not kill the enemy. Neptune's weapon could be more useful in the second half of the run, but the fact that it is needed for 2 bosses in the Wily Star (before getting the weapon drops after the Teleporter Room refights) means it needs to be saved. It is the most expensive weapon in the game, at 2 energy per shot. The splash is also laggy. Venus's weapon is really powerful but really laggy. It is only used for bosses. CONSOLES: this run is on a Super Famicon, Super Game Boy 2, and Japanese Rockman World 5 cartridge. My old time of 46:43 before SGDQ 2014, as well as the race at SGDQ 2014, was on a US Game Cube US Game Boy Player with the Japanese Cart, using an original US Super Game Boy as a controller (with a third party connector cable). I am not an authority AT ALL on timing differences for hardware, but the Super Game Boy 2's inputs feel significantly crisper and quicker than the Game Boy Player ever did. Super Game Boy 2 has more accurate timing than Super Game Boy 1, the only released US Super Game Boy. If you actually have a working one, these techniques all work on original Game Boy hardware as well. ON TO THE RUN! Submitted timing was from pushing Start on the title screen until the final hit on Sunstar. The player must push A to pass the text boxes after Sunstar, but that generally isn't included in leaderboard timings. I got the fast copters (Thank You VirtualBoyNess!). This requires jumping into the screen transition to the second helicopter from the top of the sub's movement AND entering the transition at the peak of Mega Man's jump, so the charged shot hits the copter. The rest of the stage goes excellently. I get both damage boosts and nail the sliding pipe jump before the long ladder climb. Neptune was a little off but a decent fight. Split was about 3 seconds off "gold". I missed the shot on the steam roller enemy. I also didn't get the snap back shot on the last enemy in the stage, but otherwise no complaints about this stage. Killing the first magnet-head-dust-crusher enemy with the buster is pretty precise timing but very possible. Jumping under the falling canister in the same room is terrifying. The Mercury fight here uses AI manipulation for the best time. Mercury crosses the room slowly with an even number of HP left and quickly with odd. This pattern is about 2 seconds faster than if Mercury crossed the room quickly all the time. Neptune does 2 damage, which is why Preddy was able to accomplish this pattern with Neptune's weapon in the previous SDA run. Completely screw up the first enemy, oh well. There are some more snap back kills here, as well as getting extra lemons to hit the Apes as they come on screen. The mini boss kills use Mercury to get 2 damage per shot instead of 1. The rest of the stage goes well, mostly avoiding laggy explosions and getting strategic damage boosts. The Mars fight is perfect. Neptune's weapon follow a different arc and speed depending on whether you're holding forward on the D-Pad when you shoot. I got the slide jump under the second bubble in the first room. It's also notable that you can hold ladders in the waterfalls as long as you don't touch the D-Pad or jump. I chose to use missiles in the first half of the stage to reach the ladder in that room before the waterfall arrived. I hate the second bubble-floor room in this stage. It goes well. The weapon drop before Venus does waste time, but it allowed me to "waste" ammo shooting bubbles to reduce lag without worrying about running out. The TAS can one cycle this now. Us mere mortals are stuck with a two cycle. I should be able to hit it 5 times on the first cycle. I buy a weapon tank at the enforced shopping trip for the Fist bosses later. "Swirling" your thumb on the control pad makes this text fly by. This stage is about surviving the tank enemies, some of the most damaging enemies in the series, doing 8 out of 19 HP of damage. They take forever to kill. The third one in the stage (I pass right over the second) is passed with a damage boost. This precise set of hits allows me to get to Pluto without having to heal through Mercury's weapon. I do get 2 small life drops and take 1 extra hit, but that worked out. Good stage, but Protoman didn't give me the S Capsule I wanted to refill Mars weapon energy with. This, along with not refilling Neptune here, costs time later. The Pluto fight is excellent. Venus's weapon does 1 HP of damage, so it's worth while at that point in the fight to finish Pluto with it. I chicken out on the fast strat for the first Magnet enemy, and have never been good at the Pluto strat on the second "space" room. I find these slightly safer strats for killing those magnets don't waste that much time. The rest of the stage is awesome and I kill Jupiter before the second laser. This heavily utilizes Break Dash's invincibility to "Damage" boost. I will admit here that my splits during this run were -25 seconds after Jupiter’s stage. The next few stages sadly have 15 seconds of mistakes, as I was only -10 going into the space flight. I actually get both kills with the first Jupiter shot, sweet! Jupiter is used extensively here for it's extra large hit box. Other weapons useful here could be Venus (you have to wait for enemies to come into range and see laggy explosions) and Neptune (Neptune weapon energy is precious). Eddie does not give me weapon energy :( This leads to the damage boost on the flying enemy shortly afterwards, to conserve ammo. The end of the stage, the last pendulum lag creating enemy, you can hear Jupiter destroy a shot on the jump on to the ledge. The Saturn fight went poorly, as I got hit and did not kill him on that jump. I get that shot on the refight. Side note - Saturn is the exception to buster being useful against all bosses. Do not attempt! Say hello to Rush Jet in weapon get, as you won't see him again. This is the only time you see Rush Coil get used in the run. I didn't get the slide jump to the weapon energy for 3 seconds. I got hit by an Ape, and I didn't get the quick kill on the second mini boss (and worse, wasted a shot). The stage is otherwise good. The Uranus Quick kill is fairly simple, just remember to use half charges. Jupiter's weapon is again very useful in this stage. I get 2 small jumps, which help me survive the rest of the run. It was Wily all along?!?!?! The meteors and lasers are always in the same positions. The A button boosts and makes that horrible noise. The RNG in this stage belongs to the 8 "fighters" that approach you. They can appear at any border of the screen, and move with 3 speeds. The WORST is a slow one behind you. Optimally, they all appear in front of you. They have 4 HP each. It is possible to shoot ones off the top of the screen by firing along the bottom of the screen, but I don't believe I do that here. You can't charge while taking damage either, so guiding the enemies in front of you is important. This section went very well. Before the laser section, I try to line up the bolt in Rush's shoulder with the W in WPN for horizontal positioning. For vertical, I try to line up one of the bigger stars with the front notch on Mega Man's helmet. Humans: 4 cycles, 1 charge and 2 lemons each, except the last cycle, where 1 lemon suffices. This does mean you can miss the second lemon on an earlier cycle and be okay. TAS: 3 cycles, Charge lemon Charge. Part of the difficulty in achieving this is as long as the energy is in the cannon, you cannot damage it. I have managed a charge and 3 lemons on occasion, but that would not save a cycle, and usually results in firing the full charge too early. Pluto is useful here to again avoid the "Jupiter Joes" I take the first hit intentionally to save Pluto and recoil to the right, as the steam roller would have bounced me left. Pluto is ALSO needed for the short cut on this jump. I would like to personally thank the Met that dropped the large weapon energy drop for Pluto drop here. That saved the run, allowing me to refill Mars and Jupiter on the next screen instead of having to feed Pluto with one of those two drops. It is a hero to us all. Let's Go Mets! It's worth noting that without that drop, the strat on the next screen would be to half charge Pluto Dash at the first crab, then use the sliding invincibility trick (see next section) to get past the tank without taking damage. Enker himself is only vulnerable to the buster. He gives me the worst pattern for crossing the room, but I get in the two cycle. The key to this is the one lemon that hits him on the left side of the screen just before he fires. These two weapon drops deserve a little chat of their own. The four weapons you need for the Wily star are Pluto for Damage Boosting, Mars for Quint and Venus, Jupiter for Saturn and a Mars backup, and Neptune for Punk and Mars. With my strats in Jupiter's stage, using Neptune twice, I will almost certainly not be able to use any Neptune on Mars, and it is really only on this list because RNG might let you have full Pluto Mars and Jupiter when you arrive here. When any run arrives here, it's a decision for what weapons you think need it the most. Hopefully, you will have received a random drop for SOMETHING by now, usually enough drops in Uranus's stage for Jupiter to be full. In this case, the Met in the previous section let me refill Jupiter and Mars and still have enough Pluto to finish the run. This is the screen you get to see the Plot Break Dash Sliding invincibility glitch, as I slide through the second Jupiter Joe. I miss a shot in the Quint fight. This, combined with the miss against Dark Moon and the Uranus mini boss, are enough to lose time in the Venus refight. The last shot is with Pluto to conserve weapon energy. Punk is weak to salt water. It was nice having Salt Water. SPIKES IN THE DROPS! The little hop before the shaft is enough to dodge them. Using Pluto in this section is largely to save menu time by not going to buster. Just like Mega Man IV GB, Ballade cannot made body contact to damage Mega Man if you stand against the left wall (Thanks Tremane! ), so I spend the fight there. I believe Ballade is actually weaker against Mars's Photon Missiles, but I need them for Venus. Venus's Bubble Bombs, while laggy, do excellent damage to Ballade. I ran out of missiles against Venus. Any one of the missed shots mentioned in the Quint block would have saved some time here. No second laser against Jupiter again. Outstanding. It's worth noting that I fight Saturn before Mars to ensure I have Jupiter for Saturn. The Saturn Buster fight is THE WORST. I will usually open with Neptune against Mars if I have at least 2 shots of it. It's possible to get a double hit on the first shot, which while laggy (and thus not attempted in the first fight), is worth it here with limited weapon energy remaining. However, I'm out so I go straight to Jupiter. When Mars goes to his second attack, stand just to the left of that joint in the floor to ensure you destroy the shots. It's worth noting this fight is where Jupiter’s weapon on 3DS VC performs the worst, as you won't hit Mars as often because of increased invincibility frames. Turns out the last weapon you get is Neptune’s intended weakness. No excellent Pluto fight this time, bye 3 seconds! I need Pluto's weapon next, so I switch to it for the final Lemon to remove the laggy flying life drops from the screen. The Mercury fight here used to be tricky. You want to hit Mercury with Saturn, his true weakness, up close for a double hit (10 damage!). The problem is his Grab Buster will steal a random item, and losing the Weapon Tank is a run killer. The key here is to hold B to get a half charge during the boss's intro. Once you see the half charge flashing, RELEASE B! It will never reach a full charge, and fire immediately, allowing you to reach Mercury safely. IF YOU USE A FULL CHARGE, the grab buster will not do damage but WILL steal an item, so don't do that! After this the only weapons we need are Neptune, Saturn, and Pluto. The Super Capsule from Proto Man wastes 8 seconds and does nothing to save the run. I am shaking my fist are you mightily Proto Man! Both are weak to Neptune. The TAS only manages 6 shots on the first fist, so I don't mind a two cycle with 5 hits on the first one. I don't know if it's faster, but I kill it from the right side of the screen so Mega Man's walk there is faster. The second fist will immediately retract if you are too far to the left. I think I finally have something down - get Mega Man's left toe lined up with the hash mark on the floor, and slide just before the start of the fourth measure of the boss music (not counting the little intro, which itself is 8 beats). Make sure you take out that missile, remember that holding forward causes a lower arc of the shot so let go to hit both, and nail that 1 cycle. This is intended to be a two phase fight where you fire Dr. Wily's explosives back into him over 7 cycles, then use Terra's weapon to wreck the second phase. I get close enough to Dr. Wily using Pluto's weapon to damage him with Saturn's weapon (it must be the first part, not the explosion/spread). Enjoy. Shout outs to whoever discovered this. This was in Preddy's SDA run. All weapons do 1 point of damage to Sunstar. I use Pluto to use the invincibility and fire lemons. Sadly, I don't optimally do this, and lose some time to hits. I also fail to hit him on the first try in the jump on teh third phase. This fight could by 7 seconds faster by my splits. Sadly I take too much damage here and use a safety E tank as well. The first two phases end after 6 points of damage. The best way to do phase 1 and 2 is to hold B after the shot that delivers the second hit, use a half pluto charge for invincibility, and repeat. I start Phase 2 at the horizontal position I do to set this up. There's a pause immediately after the Sunstar fight before I mash through text to breath and de-stress. Apologies to anyone timing to the last text box input or the The End screen. Fortunately I don't just sit here too long. Final shout outs to Mrs. Cab, ImCalledTyler, KBrocks, Protomagicalgirl, Darbian, XDragon, and all of #SMWRunners! Don't lose cape.